Trim the stem end only slightly since the stem is edible. Rub the cut with a slice of lemon to prevent discoloration. Rub each with olive oil and placed them into the pressure pan, stems up. Heat, to simmer, lock lid on and bring to full pressure, reduce heat to keep the pan under steam and pressure for 15 minutes. Use quick release method to release pressure by removing pan from heat and running cold water over the locked pan lid until the steam stops and the safety valve has dropped and unlock the lid. Cut the chokes in half through their length and remove the fuzzy choke at the base of the leaves, carefully keeping the heart in tact with the stem. Traditionally steamed artichokes are served with drawn butter or with a mayonnaise. Schulman uses a vinaigrette-based sauce thickened with just a bit of mayonnaise and yogurt. 1. Whisk together the vinegar, salt, Dijon mustard and garlic. Whisk in the mayonnaise, yogurt and olive oil, and blend well. Taste, adjust salt, and add pepper. Use as a dip for artichokes or other vegetables. Variation: Substitute 1 tablespoon fresh lemon juice for 1 tablespoon of the vinegar. You should have danced! that looks like a lovely recipe. Without a pressure cooker do I simply extend cooking time? Hey Sarah, sorry I did not clarify the regular method could take upwards of 45 minutes. If you tug on a leaf and it releases easily, then it is done. Good luck, let me know if you make them. BTW, a pressure pan is a great investment and time saver. You no longer have to fear minor kitchen explosions, they are much safer to use now than in times past. Love both of your pictures! 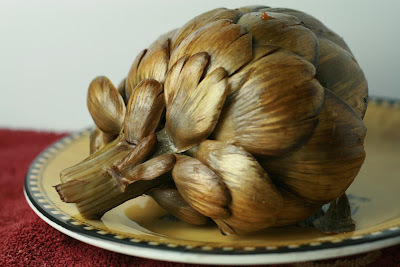 :) I have never cooked an artichoke - they always intimidate me, but I should try it! Hi Hillary, I felt the same way, totally intimidated. I can say my results were great. My advice to you: go for it! P.S. 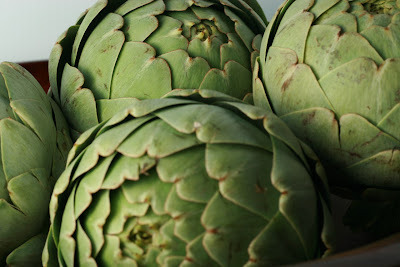 Thanks for the photo comments, and let me know if you try the artichokes.